Temperatures are expected to be on a noticeable climb across SEQLD and NENSW across the weekend and Monday, to end the Easter school holidays across the region. Above image: Maximums for Sunday via BSCH. The system which produced record breaking heat across South Australia, New South Wales and Northern VIC is now expected to finally approach North East NSW and South East QLD, and while the temperatures experienced aren’t expected to be record breaking by any stretch… they are expected to be well above the April norm and could produce the warmest temperatures for April since 2006. 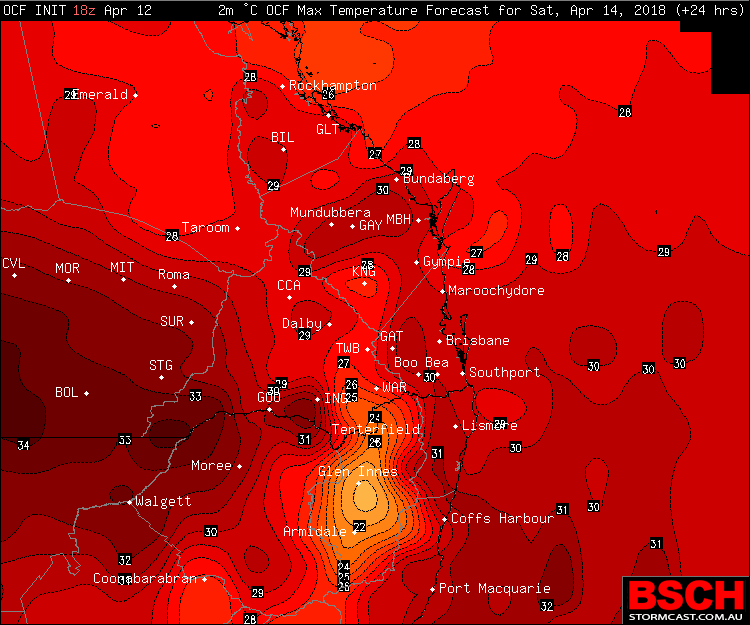 The heat will build up slightly on Saturday with maximums into the low 30’s across SEQLD and NENSW, particularly over places like Ipswich and Gatton which could see 32 or 33ºc, Brisbane City and places like Lismore, Casino, Beaudesert, Gympie are heading for around 30ºc. On Sunday, a trough is expected to near the Coast and direct hotter, drier air across the region resulting in temperatures climbing around 4ºc. 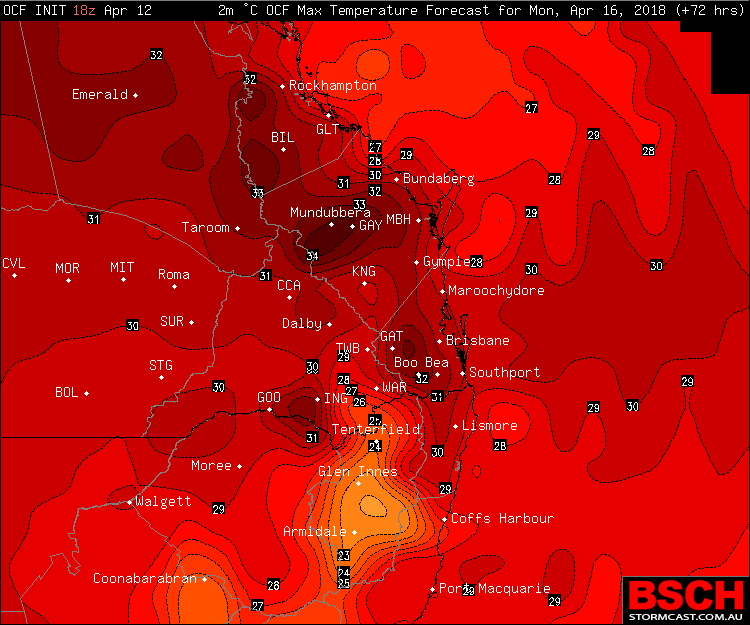 This will allow Brisbane and Ipswich to reach 34ºc, Gatton potentially 35ºc. If this was to occur, it’ll be the warmest April day since 2006 (33.7ºc in Brisbane, 35.5ºc in Ipswich). The heat should then ease a degree or 2 on Monday as the trough tracks back Inland a fraction and allows for an increase in humidity. So while it could be a degree or 2 cooler (around 31-33ºc for most areas), the humidity may make it feel slightly warmer than previous days. 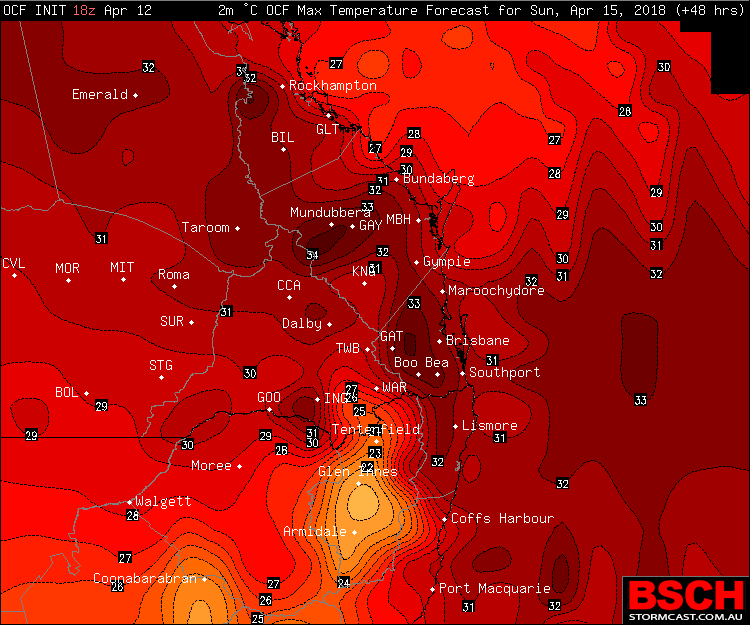 This will lead to Brisbane recording at least 3, maybe 4 straight days above 30ºc for the first time since 2002 when the City went on a run of 6 days above 31ºc. A return of showers and the addition of some possible storms are expected to break the run of 30ºc+ heat next week.